My name is Lindsay Scott. Originally from Sudbury, Massachusetts, I spent my childhood exploring our 8 wooded acres, enjoying the beauty of New England. Starting at an early age, I developed a passion for designing and building... tree houses, bicycles, furniture, architectural plans and so much more. I moved west after high school, earning my Bachelors and Masters degree at Colorado State University in Industrial Sciences and Arts Education. 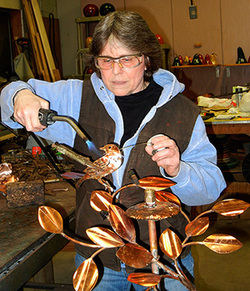 I taught Industrial Science and Arts Technology in Oregon public schools from 1978-2011, sharing my love for creating and working with my hands. My garden art business began in 2000 when I discovered the possibilities of copper as a new media. 20 years ago, I built a log home in Mulino, Oregon on 5 beautiful wooded acres. This is where I reside today, enjoying retired life and leisurely working with copper. The majority of my work is functional such as feeders, bird houses, sprinklers, misters, outdoor showers and rain chains. Each piece is unique, offering art buyers a wide variety of choices. I love whimsy, which is reflected by my choices of small critters and fun winding vines of various leaves. Much of my inspiration comes from my residence of five wooded, creek side acres. I can’t help but notice the winding vines, exploding ferns, wild flowers, giant maple leaves, curious creatures and more. What I see in nature, is my stepping stone for creating pieces that flow and carry your eye with interesting color and texture. My creativity is constantly evolving and that is exciting to me. Keeping my eyes open to nature and my mind whirling with possible new ideas, often gifts me with a new creation. It is my desire, that those who view my art see something that makes them smile, that is different and clever and appeals to them artistically.